„That was thought-through from the first to the last note“ was the opinion of the Frankfurter Allgemeine Zeitung, about a concert given by Klemens Althapp at the Frankfurt Conservatory of Music. The pianist Klemens Althapp received his musical education at the Conservatory of Music and Performing Arts (Hochschule für Musik und Darstellende Kunst) in Frankfurt a. M., Germany, where he studied with Hiroko Maruko and further at the Akademie für Tonkunst in Darmstadt, Germany, with Friederike Richter. Both courses of study where completed with the Staatsexamen. His artistic education was continued in postgraduate studies with Prof. Joachim Volkmann, Prof. Eugen Wangler and Prof. Dr. Lev Natochenny, as well as in the “Lied”-classes of Prof. Charles Spencer and Prof. Rainer Hoffmann, where he earned his graduate diploma. Klemens Althapp is a stipendiary of the Richard-Wagner-Foundation (Richard-Wagner-Stiftung). He has given numbered solo-concerts and has also established himself as an accompanist of “Lieder”. Furthermore he focuses on new means and forms of performing, also in connection with literature and visual arts. His concert engagements have taken him to Sweden, Denmark, Norway, Belgium and Switzerland. 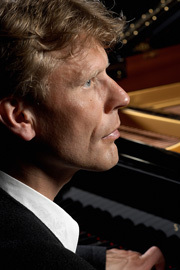 Internationale Symphoniker Frankfurt invited Mr. Althapp as soloist for Mozart’s D-Minor Piano Concerto in 2005. The Hessische Rundfunk has in several instances engaged him for radio recordings of world premieres of contemporary piano music. Mr. Althapp was awarded the Kultur-Preis (culture prize) of the City of Rodgau. For the season 2006/2007 he takes over of the artistic direction of the “Galeriekonzerte” in the Frankfurt Heussenstammstiftung. 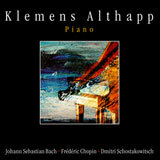 In 2005 Klemens Althapp recorded his CD with works of Dmitrij Schostakowitsch, Johann Sebastian Bach and Frédéric Chopin. This CD may be ordered via E-Mail.